German Chancellor Angela Merkel and Turkish President Recep Tayyip Erdogan (R). 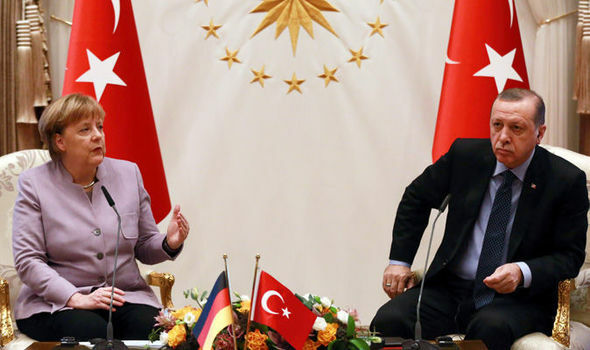 In a sign of growing frustration with Turkey’s continued arrest of its citizens, Germany moved to impose trade restrictions aimed at punishing Ankara for its behavior, an action that criticized by Turkey and poised to escalate tensions between the two allies. “The government has agreed to limit so-called Hermes debt guarantees for business with Turkey to a total amount of 1.5. billion euros for 2017,” a German Foreign Ministry spokesman said in a news conference in Berlin, according to Reuters. The guarantee system was designed to protect interests of German companies and provide them with government assistance when they face payment issues in Turkey. The move had been in the making for some time, while German authorities and Turkish leaders were involved in harsh discourse over the arrest of German nationals in Turkey on charges of espionage and terrorism. German Chancellor Angela Merkel has previously pledged to curb guarantees and reduce the trade volume with Turkey to secure the release of the German nationals. Earlier this month, the chancellor opened the prospect of ending EU membership negotiations with Turkey. The relations have been in a downward spiral since the beginning of President Recep Tayyip Erdogan’s crackdown on opposition in the aftermath of the failed 2016 coup. Up to date, Berlin has been one of the most vocal critics of the Turkish government.